A new store and entrance from South Court Street was opened when the new Phoenix Block was rebuilt after the 1870 fire. 1. Fred Schindelholtz and Clyde Gooden have established a new beauty shop called the “Blue Room” in the 2nd floor of Ziegler Display Store (in the Phoenix Block). 2. Fred took a special course in Cleveland and does permanents, marcel waving, water waving, bobbing, facials, and manicures. They will be assisted by women and have installed elaborate and expensive fixtures. 1. Miss Flora Fortson, the charming proprietress of the Blue Room Beauty Salon, at Ziegler*s Display store, Medina, recommends no one particular permanent waving machine to produce the natural looking waves which so many of her patrons enjoy because she believes that the success of beautiful permanent waves depend entirely upon the knowledge and skill of the operator and the excellence of the solutions used in the operation. The Zotos permanent, which is a machine-less wave, is, Miss Fortson believes, the best, as well as the newest permanent waving method. The Zotos is a permanent waving method is featured in her Blue Room Beauty Salon. 2. Miss Fortson has just returned from her annual trip to New York City where she was awarded a gold certificate at the hairdresser's convention for the excellence of her work there on the platform for two days before an audience of many thousand people, students and authorities on beauty culture from all parts of the world, Miss Fortson is lecturing and demonstrating this week on hair styling and coiffures at the convention held at Buffalo. We in Medina are indeed proud to have such an artiste attend to our beauty needs. 1. Blue Room Beauty Salon, moved to #248 South Court Street in 1963. 1. In the Old Phoenix Block the south room is the most elaborate in the country. 2. W. H. Bradway retired from High and Bradway and sold his interest to Elizur S. Hills for $3000 in 1874. 1. This was the successor partnership to High and Bradway Grocery Store in 1874. 1. E. J. Fenn has moved his stock of goods saved from the fire into the south room in the Phoenix Block, where he will close them out at exceedingly low prices. Now is the time to buy goods cheaper than ever before. 1. 1898 - O. H. McDowell has purchased the dry goods stock of G. A. I. Boult and the same are to be transferred to the Phoenix Dry Goods Co., which is soon to start. Ben Boult, who has been associated with his father in business for some time, and who is known as one of the best experienced business men in town in the dry goods line, will become a partner in the new business McDowell Brothers opened the door to their south store today. It is filled with a choice assortment of holiday and seasonable goods. 1. 1st telegraph office was installed in Old Phoenix block on west side next to William Asire Furniture Store. 1. Leased part of the ¼ south rooms in Phoenix Block and will remodel and continue business in 1927. 1. In 1961, Edward Morton sold the business to David B. King and Ted Gavin. 2. In 1964, Medina Camera and Music moved to 110 West Washington Street. 218 South Court Street was closed with a brick front for the remodeling project of the Old Phoenix Bank in 1965. The Livery Stables at the rear of the Phoenix Block were removed in 1877. William Asire purchased from John Speer the building in which the Gazette was printed at 226 South Court Street. 1. When built the Asire Building was a 3 story brick structure measuring 25’x70’. 1. 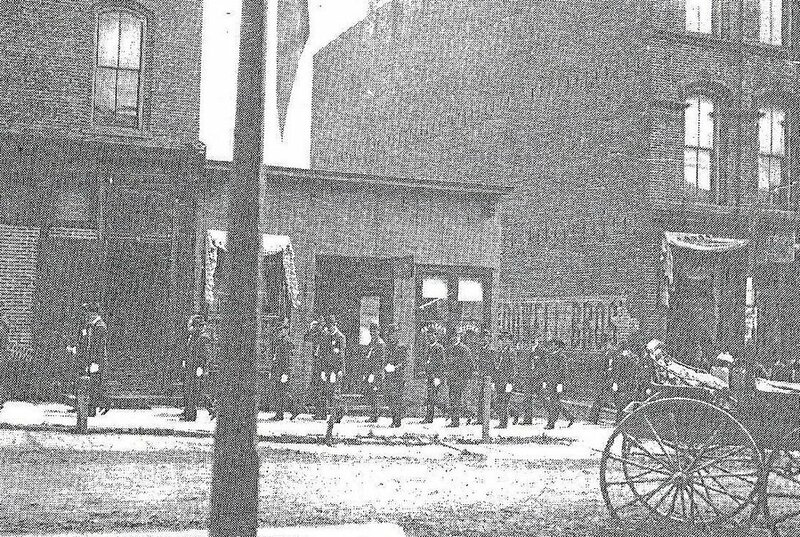 Hiram Goodwin was wiped out in 1870 fire and he opens up a grocery and hardware business in a little frame building where Asire block is now (written in 1915). 1. Hyram Marks kept a meat market in a little frame building where Sargent and Wertz furniture stands (written in 1922). 1. William Asire cabinetmaker and undertaker started business in basement of the Congregational Old Brick with E. L. Little from 1850-1873. 2. In 1872, William Asire, general furniture dealer and undertaker, had business for the year totaling $6,000. 3. Asire funeral carriage had white horses with black netting. 4. 1879-Aldis Asire left Medina Wednesday for Germany, where he will pursue his musical studies at the celebrated conservatory in Stuttgart. 5. Aldis Asire is a music teacher upstairs in Asire Block 1887. 6. Berea flagstones in front of the Asire Block in 1871, curbstones sunk two feet and posts for railing sunk three feet. 7. Wells and Chandler built fire escape from the top of the Asire Block in 1877. 8. Asire has a piano wagon with two splendid white horses 1880. 1. E. J. Fenn has moved his Dry goods stock to Asire’s furniture store, one side of which has been temporarily fitted up for his accommodations. 1. Jay Sargent bought the Aldis Asire the furniture and undertaking business. 2. Jay Sargent sells dining room furniture, French leg tables, buffets & china closets 1901. 3. The elevator in Sargent’s furniture store brakes on cable failed sending elevator into the cellar, occupant a little bruised in 1901. 4. Aldis V. Asire listed for sale the Asire Block, a 3 floor brick building, 25 x70 feet with 7’ basement electric lights for $5000. 5. Asire sold the Asire Block to Winthrop E. Sargent for $4400 in 1899. 1. Sargent sold the furniture business in 1930 and just does undertaking. 2. Sargent and Wertz operate a motor ambulance in 1919. 1. Arthur Rose leased store for upholstery business in 1935. 1. Jessie L. and Frank Sargent sold the building to Eva and A. Lewis Schwartz in 1945. 1. Home Decor and Gifts – Now in Our 16th Year! 1. 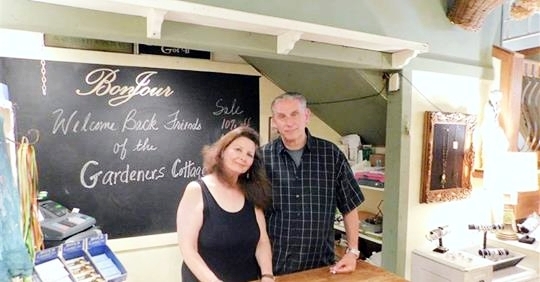 Gardener’s Cottage gift shop in a building in the Historic District that partially collapsed 0n February 19, 2018 will be saved. City officials feared the building at 226 S. Court St. would have to be torn down. 2. The back wall was just a brick façade and when the rain water got behind it, there was nothing there to hold it. The back wall has to be rebuilt from the ground up. 3. After an inspection by Westfield Insurance and building consultant Rudick Forensic Engineering, of Youngstown, it was determined to be repairable. 4. The side walls to the three-story building, built in 1873, were load-bearing. Even though there are some cracks on the side walls, city Building Official Dan Gladish said they appear strong. 5. Gardener’s Cottage gift shop in the building will remain closed indefinitely until the back wall is rebuilt. 7. The block of South Court Street closed since Monday morning where the collapse occurred reopened Wednesday afternoon. 8. Gladish said 18 residents and businesses were forced out because of the incident. With the exception of Gardener’s Cottage, the businesses are expected to be open today. 1. J. F. Collins sold out to Johnson and Twining in 1901. 1. Johnson and Twining sold out to Turner and Boley in 1904. 1. Bought out grocery business of J. R. Gable, in store room formerly occupied by A .J. Nelson now connected by ample doorways. 2. Stairway cut to big basement room with stone cut through on South side of store. 3. 1920 C. J. DeArmitt closed Department Store in Greisinger block, will concentrate on Medina Home Company and run for Medina County Commissioner. 1. The latest in fluorescent lighting has been added to the studio which is now on the street floor. 1. Mr. Schultz opened his second store in Medina at #113 West Liberty Street in September, 2016. 1. They moved from #241 South Court Street in 2015. 2. The Dress Bridal Boutique was founded by local bridal expert Sara Recker with one goal in mind, "I wanted to bring something to Northeast Ohio that the bridal scene had not yet experienced." The Dress opened in April 2010, bringing a fresh, vibrant, and contemporary shopping experience to the historic town of Medina, Ohio. 1. Henry’s first job was with Isaac R. High in the grocery business, leaving that to enter the barber business, which he has followed for 58 years. 1. From the beginning of history we have heard many songs raising the beauty of my fair lady. We are told of the beautiful Princess of the Nile whose fame has come down through the pages of history for over 3000 years and we have also heard of her beauty secrets. Therefore the art of beautifying is not modern but one of the most ancient ones. Chemists have devoted many years of study to the subject and every new discovery is hailed with delight needless to say, after thousands of years, the secrets of beauty attainment have very nearly reached the heights of perfection and the modern Medina County woman is even more lovely today than was the so thought Cleopatra of so many years ago. 2. A visit to the Cleacos Beauty Shoppe 251 S. Court Street, which is a well-appointed salon, will convince milady that here is a beautician who is equipped, to assist her in bringing out the most of her charms, to bring out and preserve her good looks by simple, natural methods. Miss Irene Kraver, the proprietress, is a Medina county girl, and is seemingly always busy in her chosen profession. There seems to be nothing about her work which she does not thoroughly understand and she is always on the lookout for some additional bit to add to her store of knowledge. Miss Kraver has a most pleasing personality, which goes such a long way in beauty work. 3. She was graduated from the Cleveland Academy of Beauty Culture and has owned her beauty shop for the past six years. Miss Kraver has been chosen the Medina County editor of the Beauty Review magazine which is many things to give to Medina folk through this medium. Telephone Cleacos Beauty Shoppe 3005 or ask Miss Kraver personally. Of what special interest is the Beauty Review to every Medina County woman? 1. Salon sold to Marie Quanti in 1945. 1. Perfectly Charming is a unique shop brimming with an ever-changing assortment of vintage and painted furniture, unique accessories and inspiring decorating ideas to freshen your home.